Bailey McDaniel is a junior at Mississippi State University studying criminology. She is the president of the LGBTQ+ Union, the LGBTQ and minority rights activist group on campus. She is also the former opinion editor for the student newspaper, The Reflector, and serves as an undergraduate board member for the Safe Zone Advisory Board. 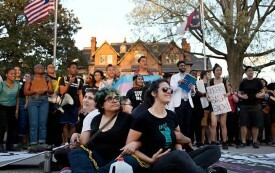 The movement for trans justice is—or can be—a movement for racial justice.